Warning: This review may contain spoilers concerning Shadow and Bone. The reason I really enjoy this series is because, like in any good fantasy novel, there's that wonderful balance of plot-driven adventure and super engaging people. The main focus is on Alina's journey but then the story's jam packed with a series of epic mini-quests, as well. It's one seriously crazy ride! I'm never quite sure where Bardugo is going to take it and I love the unpredictability of it all. The only slight thing that threw me about Siege and Storm was the pacing. The action stalls towards the middle but Bardugo more than makes up for it with that high impact finale. By the end, Ravka is on the verge of an all-out war and the tone is desolate. We've lost some key characters and the fates of many others are left unknown. Talk about wanting, no, needing to know more! The other thing I love about this series is that the characters have so much dimension and, well, character! The Darkling is dark as ever, Mal has grown distant and resentful and Alina struggles with her new-found powers. I'm really interested to see how far down the rabbit-hole she goes. I want her to overcome that darkly powerful pull, but at the same time, some sick part of me really enjoys seeing her struggle. She's a bit of a downer in this book but it's understandable given her situation. As the characters progress along their individual journeys, circumstances change as do the relationships between them. I'm not going to lie, it can get really frustrating at times, especially if you're rooting for one coupledom over another. But, then again, I think that says something for the strength of Bardugo's writing --- it makes you feel something. It's that whole love/hate thing we have with really well-written characters. We must accept the change because we're invested in them. Oh! Oh! 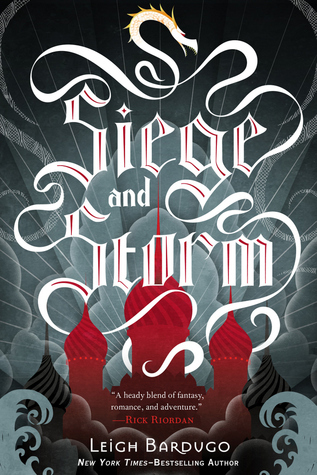 And for those of you who are Darkling fans, you're in for a real treat with Siege and Storm because Bardugo one ups herself with the addition of a new fan favourite. Meet Sturmhond. I didn't think it was possible for me to love anyone as much as I loved The Darkling but, yet again, she proved me wrong. Sturmhond is the colourful, charismatic, witty privateer who has quickly become my favourite character in the entire series. To say he's a multifaceted character is an understatement and I'm really excited to see where she goes with his story. 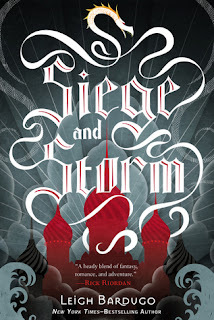 Overall, Siege and Storm blew me away and was more than a worthy follow-up to a very strong debut. Siege and Storm is one of those rare follow-up books that supersedes even the first. Chalk full of intense action, magical adventures and engaging characters, you'll never want to put it down. This is one of those unpredictable fantasy series that keeps on getting better with time. "Kirked out"? Are you from the DC area, by chance? Kirked out --- as in freaked out (in a good way). I'm actually from the Baltimore area, though I do spend some time in DC occasionally. This book was great. Cannot wait for the next one and the movie that is sure to come which I've said would happen since Shadow and Bone. Watch out Harry Potter!